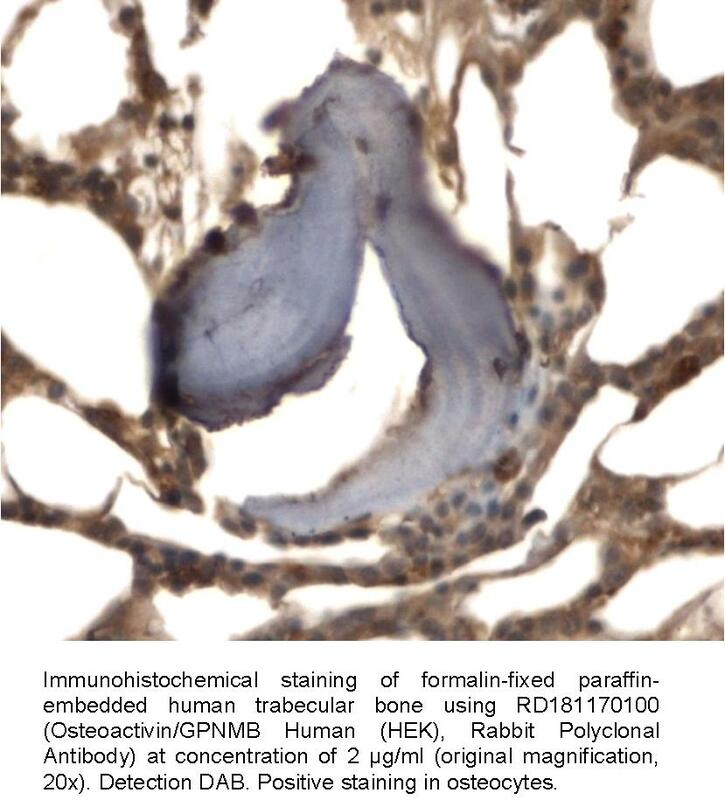 The antibody was raised in rabbits by immunization with the recombinant Human Osteoactivin. Total 477 AA (whole extracellular domain Ala 22 – Pro 486). MW: 53.7 kDa (calculated), migrates at ~ 97 kDa on SDS-PAGE; C-terminal linker (Lys, Leu) and 10× His-tag (10 extra AA highlighted). Immunoaffinity chromatography on a column with immobilized recombinant Human Osteoactivin. Osteoactivin (OA), also known as Dchil (dendritic cell-associated, heparin sulfate proteoglycan-dependent integrin ligand), Gpnmb (glycoprotein non-metastatic melanomal protein B), or Hgfin (hematopoietic growth factor-inducible neurokinin 1), is a transmembrane glycoprotein. The OA gene, located on human chromosome 7p15.1 encodes a protein of 572 amino acid residues. OA may exist as a 65-kD unglycosylated cellular protein or as multiple glycosylated proteins with molecular size varying between 80-kD to 139-kD. Glycosylation of proteins plays a crucial role in cell differentiation and function. The transmembrane OA can be proteolytically cleaved by extracellular proteases, such as ADAMs and MMPs, in a process called ectodomain shedding, which results in the detachment and release of the extracellular domains which act as cytokines or growth factors. OA is expressed in a wide array of tissues and plays a regulatory role in various cellular functions. OA expression is associated with cell differentiation with high expression levels of OA protein found in the nervous system, basal layer of the skin, germinal cells of hair follicles, and in developing nephrons of the kidney in mouse embryos. In immune cells, OA was detected in differentiated macrophages, lymphocytes, and dendritic cells, but undetectable in proliferating hematopoietic progenitors. 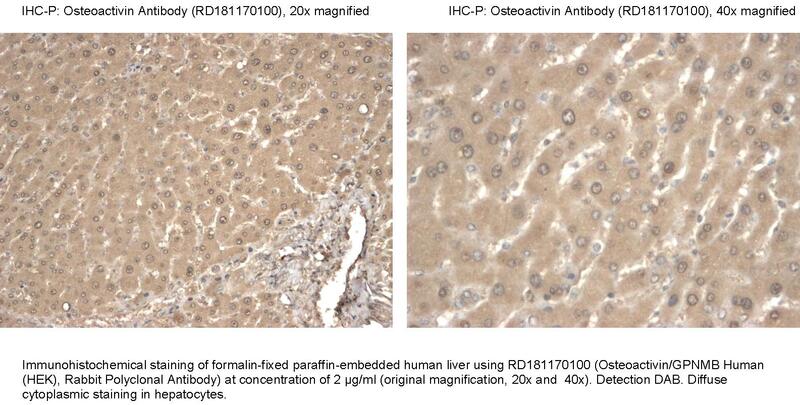 It was reported that osteoblast-derived OA has a regulatory role in osteoblast differentiation and bone formation. OA expression in osteoblasts is up-regulated by bone morphogenetic protein-2 (BMP-2) and OA appears to be a key mediator of BMP-2-induced osteoblast differentiation. Because of its suggested functions in cell adhesion, migration, and differentiation in various cell types and tissues, OA has been implicated in physiological and pathophysiological cascades of tissue injury and repair. In addition to its diverse roles in normal cells and tissues, aberrant OA expression is linked to various pathological disorders such as glaucoma, kidney disease, osteoarthritis, amyotrophic lateral sclerosis and several types of cancer, including: uveal melanoma, glioma, hepatocellular carcinoma, and cutaneous melanoma. The discovery that osteoactivin is selectively overexpressed in aggressive bone metastatic breast cancer cells suggests an important role for this molecule in the progression to metastatic breast cancer.